Hello! 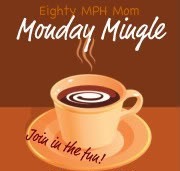 I recently stumbled across Monday Mingle and I think it’s pretty fabulous, so I’m going to start doing it. So. Here goes. 1. Where do you think you’ll be/what you’ll be doing in 10 years? 2. You are ordering a hamburger at a restaurant (or veggie burger – how do you have it cooked, what type of cheese and what else goes on it? I love a classic cheeseburger. I keep it pretty simple. Cook it Medium Rare, slap a couple slices of sharp cheddar on it and top it off with pickles, ketchup, and mustard. Richard has a polar opposite view of cheeseburgers (and his food in general). He’s always trying to optimize his meals. Because of this, we like to go to The Counter in Lincoln Park. This restaurant has fabulous fresh food and Richard can build the most insane burger he can think of while I enjoy my usual. 3. What are the current gas prices like where you live? I just bought gas for $3.89. It was painful. I really hope Bill Gates gets this Uranium 99 thing figured out soon. Feel free to leave your answers to these questions in the comments. Also, make sure you stop by the other Monday Minglers and show them some love!